Once upon a time, I considered switching majors from Illustration to Textiles. I took a few textiles classes, and had a bit of a knack for it. I did some sewing in my spare time (and made a nice bit of cash off my hobby at the school’s craft fair), so the idea of designing my own fabrics for my projects was appealing. But I quickly came to my senses, and decided to stick with my true love, illustration (learning nothing, I would go on to have a brief, painful affair with printmaking). What made me change my mind was the fact that, while studying illustration, I could continue to work on textile and printmaking projects in my spare time. It would be much harder to study illustration on the side. That said, I’ve gotten rusty. 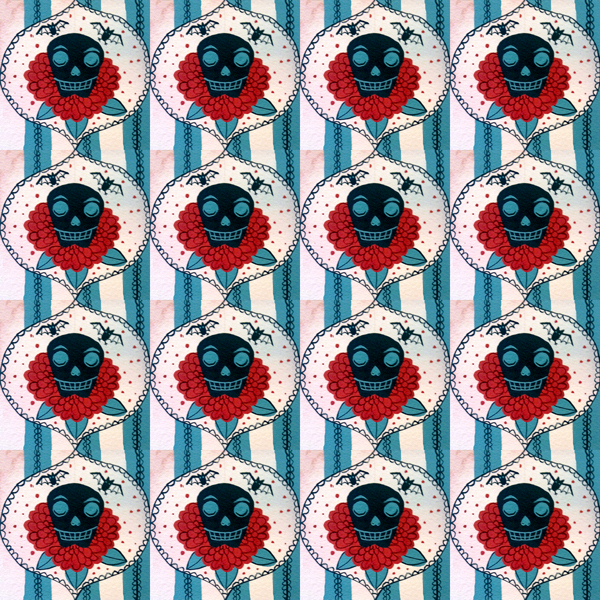 I decided yesterday to try to make a quick repeating pattern, and it came out okay. I’m sure it would look nicer if I took the time to scan it, but I’ve only got an iPhone camera to work with right now. I’ve been meaning to put things on spoonflower for ages…. someday! I’m fascinated by textiles and illustrations… do you use Adobe Illustrator or another program?? Is it difficult to learn… it looks it! I actually don’t use any programs for making patterns (too confusing! ), it’s all grid based. This is actually a 3×3″ painting that I tiled in Photoshop.